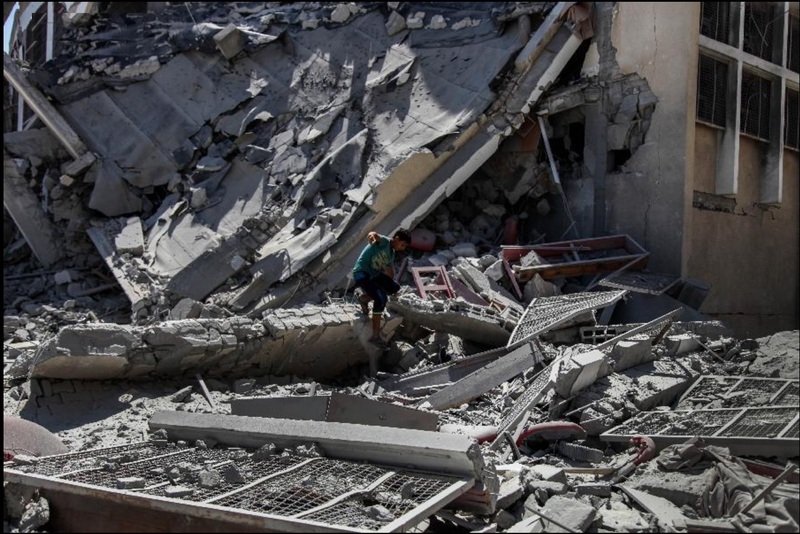 JNN 26 Aug 2014 GAZA — A new Gaza ceasefire came into effect on Tuesday at 7:00 a.m. (0400 GMT), after an agreement reached Between Palestinian and Israeli authorities, brokered by Egypt, reached between Israel and the Palestinian factions, including Hamas movement. According to Palestinian sources, the Palestinians and the Israelis agreed to a permanent ceasefire on Tuesday. “The contacts that have been going on have agreed a permanent ceasefire, a (deal to) end the blockade and a guarantee that Gaza’s demands and needs will be met,” media quoted a senior unnamed Palestinian official as saying. At 7:00 p.m. militants intensively fired into the air celebrating what mosques announced on loudspeakers that the Palestinian resistance has made a victory. Cars in the streets turned its front lights on and drivers pressed on the horns of their cars. Palestinian President Mahmoud Abbas announced on Tuesday evening that a ceasefire agreement reached in Cairo between Israel and the Palestinians will be valid at 7:00 p.m. (0400 GMT) in the Gaza Strip. Abbas made a brief statement aired on the official Palestine Television that a long-term truce agreement was reached in Cairo and it is valid at 7:00 p.m. (0400 GMT). The contentious subject at the Cairo talks has been the issue of the Israeli blockade of the impoverished territory. The Palestinian resistance movement Hamas wants the seven-year siege of Gaza, which has crippled the coastal enclave and tightly restricted the movement of goods and people, to be removed. The Palestinians also demand that the coastal territory be allowed to open an airport and seaport. “I would like to announce that the Palestinian leadership accepted Egypt’s call to go for a comprehensive and permanent ceasefire and then we will work on meeting the demands and the needs of our people in Gaza,” said Abbas. Sami Abu Zuhri, Hamas spokesman in Gaza, told reporters at Shifa Hospital that Hamas movement and the Palestinian resistance won the battle against Israel and achieved an honorable victory. “With the help of God and the sacrifices of our people, today, we declare our victory on the Israeli power of repression. Our armed resistance achieved what the Arab armies had failed to achieve,” said Abu Zuhri. “Now Hamas allows the Israelis in the settlements outside the Gaza Strip to return to their homes after the ceasefire agreement came into effect. It is Hamas decision and not the decision of Benjamin Netanyahu,” said Abu Zuhri. On July 8, Israel started to wage a large-scale air, sea and ground military operation against Gaza Strip militant groups, including Hamas and Islamic Jihad movements. The Gaza health ministry said in a press statement that during the offensive on the Gaza Strip, Israel killed 2,140 and wounded 11,100 others. Meanwhile, Israel said Gaza militants killed 69 Israelis, including 64 soldiers and five civilians. This entry was posted in Middle East and tagged Gaza, Gaza Strip, Gaza Strip Ceasefire, israel, Isreal, Palestine, palestinian president mahmoud abbas, Truce. Bookmark the permalink. Gaza is an Israeli scam. Its temporary truce unless Israel agreed to Free Gaza, Open Airports, Harbors, Independent Currency, No Blockade and over that a million Dollar for each Gazan elder, woman and child murdered in cold blood by Israelis, Hamas and PA in 68 years stunt show.